The rooms of the B&B Palazzo del Teatro have been designed to give guests maximum comfort and offer an experience in an intimate and personal atmosphere, attentive to the need of the guest. A sophisticated city residence, a viable alternative to the hotel, even luxury, a point of reference far from the often anonymous reception of hotels and with a five-star service. A luxury Bed and Breakfast in Agrigento, city of the Valley of the Temples, where elegance is combined with the typical hospitality of bed and breakfast in the historic center of Agrigento. You will live in silence, tranquility and privacy to give you the best days in Piazza Pirandello, a stone’s throw from Via Atenea, Agrigento’s nerve center, and the Pirandello Theater. The charm of the past mixes with contemporary charm, in the four rooms furnished in full respect of its historical tradition. High stucco ceilings, contemporary furniture, antique paintings and fine tapestries warm up our seven spacious rooms, bright and cared for in every detail, equipped with private bathroom, air conditioning, safe, free Wi-Fi, mini-bar and room service. A charming B&B, where the element of the architecture and the personal style of the owners go to find the right balance between elegance and conviviality, free time and excellent hospitality. These elements make Palazzo del Teatro an excellent base for those who come to Agrigento for work or leisure. Welcome drink – you will be welcomed in the comfort of your room with a bottle of champagne. Reserved and free multi-storey car park. “You on tour” guide – free for you the complete and innovative tour guide of Agrigento and the surrounding area. Best available price guaranteed! By booking through our website you will always get the best available rate. No commission in addition to pay between you and the “B & B Palazzo del Teatro”, no intermediary. And the management of the practice becomes simple and immediate. Guaranteed certainty and quality. All images and information contained on the site are true. The transperence is our strong point. Packages and special offers. Only on our site you can find a wide selection of packages and special offers for your holiday in Agrigento. Immediate confirmation. You will receive an instant confirmation email with all the details of your booking. A relaxing weekend brings all the comforts. Elegance, easy movements, high-end kitchens and why not, the possibility to park your car right in the city center. The Palazzo del Teatro, located in the center of Agrigento with parking, will offer you all this. You will arrive comfortably near Piazza Pirandello, from which you can discover not only the city, but all of Sicily and every evening, when you return here, in your accommodation, you can save time and effort, leaving your car in the guarded multi-storey car park reserved simply through a card that we will deliver to you at check-in. Whether you are here for a relaxing weekend, for a few days out of town or for work you will appreciate the possibility of not giving up moving with your car, getting rid of any stress from traffic, parking and crowded vehicles. All of Sicily will be at your fingertips and you will be able to enjoy every corner of this beautiful region in the most comfortable way possible. Why, then, just choose a structure in the city center, when you can have more? 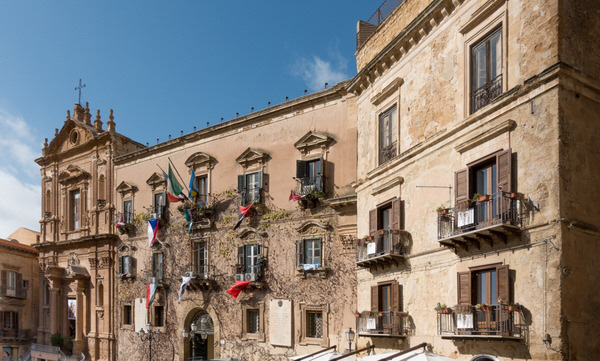 Book your stay at the Palazzo del Teatro, among the few parking facilities, in the beautiful Agrigento. Check-in is from 2:00 pm and check-out by 11 am. Our staff is at your disposal if you need to anticipate your arrival or postpone your departure. The city of Agrigento requires the payment of a Tourist Tax equal to € 2.00 per person and per night, up to a maximum of 3 nights from the fourth night the cost is € 0.20 per person. Residents in the municipality and children under 14 are exempt.The amount must be paid directly in the Hotel at the moment of arrival or departure.